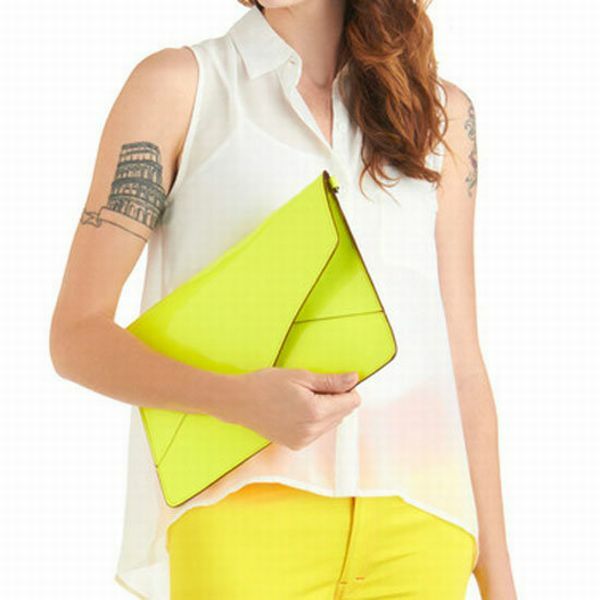 Melie Bianco has created new iPad cases and a Neon tablet clutch with the help of faux-leather. The shoulder and wrist straps are detachable so that they can be carried as sling or clutch. Your tablets are safely protected in the high end designer clutch which measures 13 inches length and nine inches width and priced $53. If you are a fan of bold colors and would like to bring a playful touch these compact neon clutches can be the right choice and they also give you an effortlessly chic look if you are obsessed with trendy looking clutches for your most expensive iPad and tablets. The sleek looking clutches are lightweight which makes it easy to hold and carry. You may like even bigger sized envelop clutches to accommodate your work files and to keep your essentials like over sized jewels hoping to accessorize for the evening tutorials. Don’t assume always bigger is the better. The compact neon envelop is adorable for your most expensive laptop and there is no doubt about its being popular and getting approval of its users as they are incorporated with the summer wardrobes. I have been waiting always for the envelope clutch to be updated for my iPad. The neon envelop clutch is really great and I love everything about it from its color to design which is perfect to slip my iPad. It is totally modern; with vibrant color functional at the same match your heeled loafers. The cool color is mood elevating andcan be used during incessant rain.